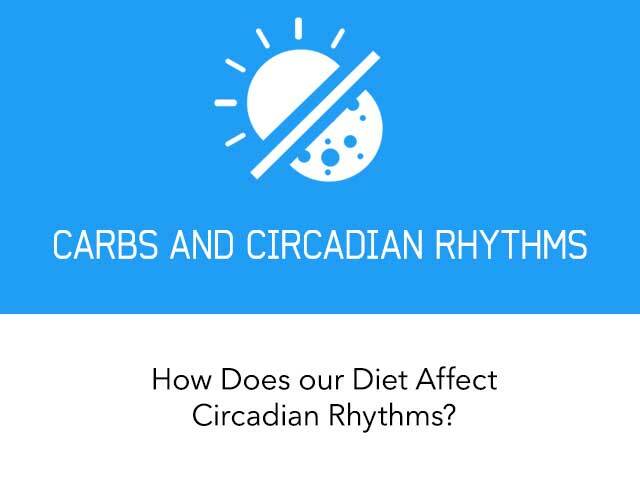 How Does Our Diet Affect Circadian Rhythms? Over the past hundreds-to-thousands of years, peoples around the world have thrived on a wide variety of diets. Food has changed a lot seasonally, geographically, etc. What hasn’t changed? The 24-hour light/dark cycle to which our circadian rhythms are constantly entrained. In general, your circadian phase is based on the 24 hour day, roughly 12 hours in the light, 12 hours in the dark (varies seasonally and geographically). Many hormonal and biochemical effects are influenced by this. Light, darkness, and food are what, in part, determines your circadian phase. Examples of this would be going to bed earlier and waking up earlier. 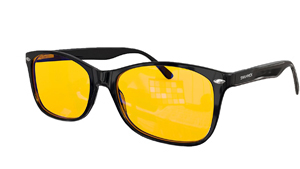 Similarly, wearing blue light-blocking at sunset to mimic the natural spectrum of sunlight, which has a higher blue:red ratio in the morning and less blue at night -- thus, wearing blue light-blocking glasses if you’re exposed to artificial light at night. Flying from California to New Jersey shortens your day by about 3 hours. If you’re living by natural circadian rhythms, this means you’re going to bed 3 hours earlier (takes some time to adapt, but this is just an example). Basically, the opposite of everything above: for example, staying up late and sleeping in. Flying from New Jersey to California lengthens your day by about 3 hours: if you’re living by natural circadian rhythms, you’re going to be really tired at bedtime. Importantly, some preclinical studies suggest diet may play a role in this. In assessing circadian rhythms in animal models, researchers monitor activity for a couple weeks in normal light dark cycles then turn out the lights and see if the activity patterns shift earlier (phase advance), later (phase delay), or don’t change in the following weeks. 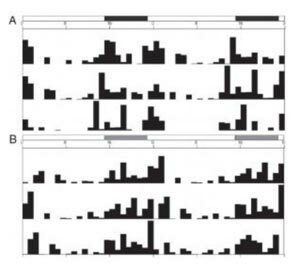 The top half of the figure below shows the activity pattern of rodents fed a “Control” high carbohydrate rodent diet in a normal light/dark (LD) cycle and as you move downward, it switches to complete darkness (DD) (Oishi et al., 2009). This is what a phase advance looks like. You can see the periods of high activity (dark black spots) move progressively to the left, earlier. 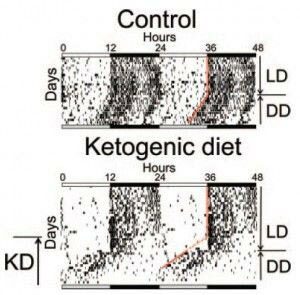 The bottom half of the figure shows rodents on a ketogenic diet. The phase advance when switched from LD to DD is more robust. In a similar follow-up study, the researchers next tested a very high protein diet (Oishi et al., 2012). As seen above, during normal light/dark conditions, activity was concentrated in the active phase. When switched to dark/dark, we see a similar phase advance as seen in the “Control” conditions above. The bottom half of the figure shows activity during normal conditions and then switching to all darkness. Similar to rodents on a ketogenic diet in all darkness, rodents on a high protein diet show a more robust phase advance in all darkness. What do the ketogenic and high protein diet have in common? They are both low in carbohydrates. In the first case, most of the calories were replaced with dietary fat; in the second case, most of the calories were replaced with protein. In both cases, the animals fed ketogenic and high protein diets were healthier than standard (high carbohydrate) diet-fed animals. Animals exposed to dim light at night exhibit deteriorating metabolic health and a circadian phase DELAY (Fonken et al., 2010): don&apos;t do this. The top half of the figure shows normal 12-hour light/dark cycle. The black bars indicate activity levels. Comparing the top to the bottom, more activity shifts from left to right, indicating animals being more active later in their active phase. Bright light in the morning entrains the master clock in your brain. 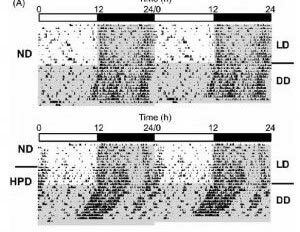 The food-entrainable oscillator (FEO) kickstarts circadian rhythms in peripheral tissues when you eat breakfast (eg, Polidarova et al., 2011 and Sherman et al., 2012). These two events (ie, bright light and food intake) should be timed together to co-entrain central and peripheral circadian rhythms. If optimal circadian is your goal, follow a low carbohydrate and either high fat or high protein. Avoid smart devices at night or get some blue-blockers to prevent a circadian phase delay. Eat well, sleep well, be well. Do you like this post? Share it with your friends! Hi, I’m Bill. I have a Ph.D. in Nutritional Biochemistry and Physiology from Rutgers University where my dissertation focused on fatty acid-binding proteins and energy metabolism. I studied inflammation and diabetes at UCSD. And most recently, I studied circadian biology at the Mayo Clinic. I have a broad range of knowledge about health, wellness, sickness, and disease... and I’m learning more every day! 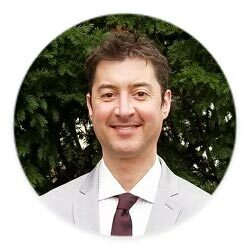 More posts by Bill Lagakos, Ph.D. This article was written by Bill Lagakos, Ph.D. who is a qualified expert. At KetoDiet we work with a team of health professionals to ensure accurate and up-to-date information. You can find out more on the About us page. Evidence-Based articles are based on medical research, and scientific evidence. Our expert authors focus on hard evidence alone and include relevant research references from trusted sources to support their articles. We always aim to deliver relevant, trustworthy and up-to-date information based on trusted evidence and proven research. Let us know what you think, rate this post! Hyperinsulinemia and Men's Health: Is There a Male Equivalent to PCOS? Is Gout Caused by Red Meat or Metabolic Syndrome? This information and telling people not to create a circadian delay is all well and good, but what about those of us who HAVE to be awake at night? I am a nurse who works night shift. I'm finding it difficult to maintain this dietary regimen, as well as any normalcy of sleep. Any suggestions? Thanks for asking this, I also work a 10/10 rotation, with every second work rotation being 10 nights. I feel it is really messing with my stress and cortisol/dhea levels. Can a Ketogenic Diet Help Control Appetite and Hunger? Is a Very Low-Carb Ketogenic Diet Healthy? Can a Ketogenic Diet Help People with Acid Reflux? Can the Ketogenic Diet Help Patients with Brain Cancer?